Alex Oxlade-Chamberlain has been stepping up his recovery for Liverpool. The news of his return to training can’t come at a better time for the reds as they push to secure another Champion League Finals spot playing against Bayern next month. 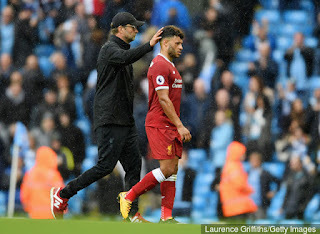 Speaking to Liverpool’s official website, Jurgen Klopp has claimed that it was ‘unbelievable’ to see Alex Oxlade-Chamberlain move so well in training, after nine months on the sidelines. The 25-year-old midfielder hasn’t kicked a ball for Liverpool since a Champions League semi-final with Roma at Anfield last April, when he suffered cruciate ligament damage in his knee. Footage emerged this week of Oxlade-Chamberlain doing some ball work in training during the Reds’ warm weather training camp in Dubai. And the German manager admits he was blown away to see him looking so fit, insisting that he looked ‘completely fine’. He told Liverpool’s official website: “I loved it [the clip of him training] like the fans loved it, if they loved it! It is just brilliant! Klopp added that although the former Arsenal midfielder – a £35 million signing in 2017 [BBC Sport] – is no longer injured, he is nowhere near being match fit and is refusing to rush him back. This is like a new player!